I did this as a way to use up some plain rice from the fridge and some broccoli and cauliflower that, in fairness, had seen better days! I added chicken but really add any left-over meats, prawns etc would be OK. I think I’d like it with little bits of sausage – but who has left over sausage!? I deliberately didn’t add any chilli to the dish as our 15 month old was going to enjoy this- but I think it would have been a nice touch. 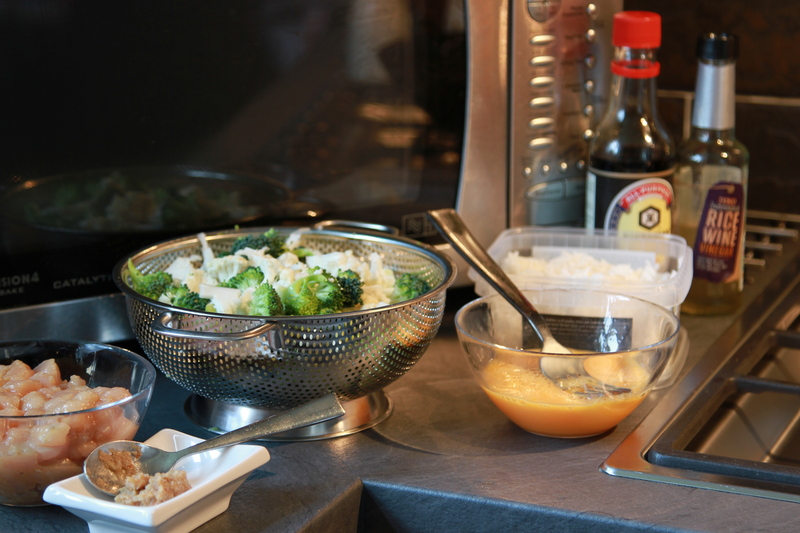 Use cold, cooked rice from the fridge for stir-fry – it won’t all stick together the way that freshly cooked rice can. I used Basmati rice. Have everything ready and standing by when you are about to cook. Stuff burns fast in a hot wok! Break them up in to pieces roughly the same size. You can chop the stems up into similar size pieces as well. – packet of broccoli and cauliflower florets (that have seen better days!) chopped or broken in to small but still recognisable pieces. – 4 chicken breasts – chopped up into little 1/2 cm cubes. Get all your ingredients ready and to hand near your wok of you can. Marinade the small pieces of chicken in two tablespoons of the vinegar, soy sauce and a teaspoon of each of the garlic, ginger and lemongrass paste. Add a drizzle of sesame oil and enough sunflower oil to ensure all of the chicken is well coated. It’s best to use your hands to massage the marinade well into the meat. Leave it on the side ready to use in a moment. 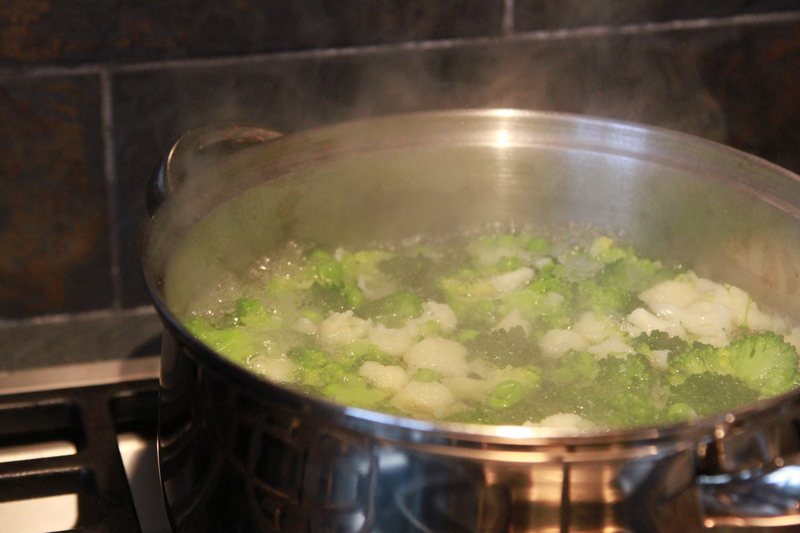 Set a pan of water to boil and blanch the broccoli and cauliflower; while the water is boiling…. Heat the wok until it begins to smoke and add some sunflower oil . It will ripple. 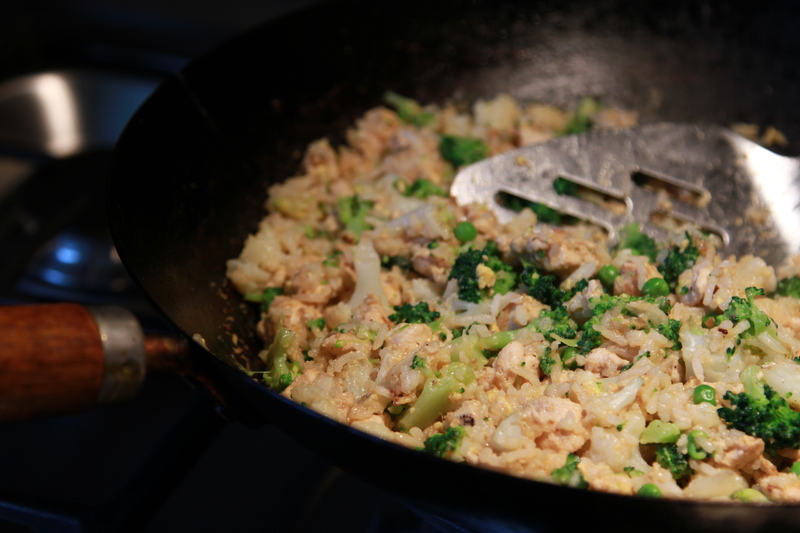 Add the chicken pieces and stir fry to get a little colour on it. If you wok is small or the chicken a lot, don’t overload the wok or your chicken will boil rather than fry – do two batches. When browned remove the chicken to a bowl ready to add back in a moment. Pour in the beaten eggs and swirl the wok around to let the egg run up the sides and increase the size of the omelet; before it sets, scramble it with a spatula. Add the cold rice (and a drop more oil if necessary) and stir constantly scraping the mixture off the sides of the wok. I add the garlic and ginger paste at this point as otherwise I’ve had problem with it burning in the hot oil leaving a bitter taste. Stir fry this in well as well. Season the rice with the soy sauce and a drizzle of sesame oil. Have the blanching veg next to your wok, ready to add. 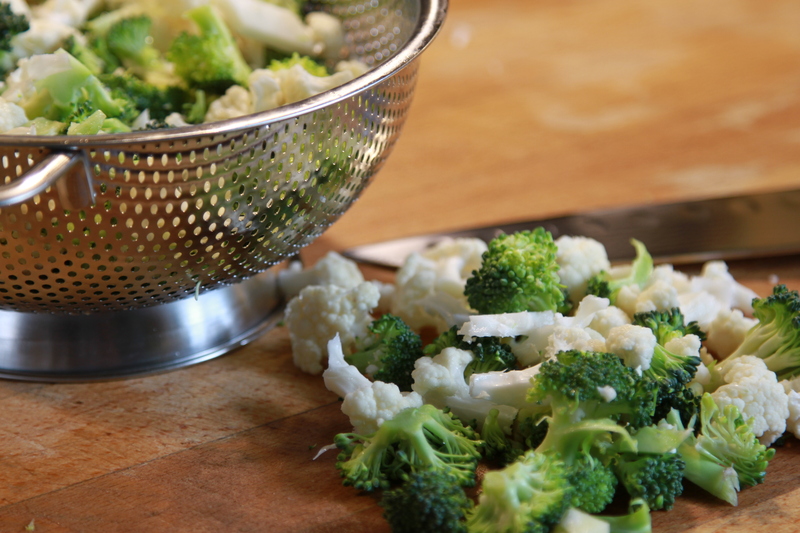 Using a slotted spoon or sieve with a handle, transfer the blanching veg from the boiling water to the wok. Don’t worry if a bit of water comes across as well with the veg, the steam will be good for the dish. Add back the chicken and mix it all together. Add more soy if you need to but taste it first in case it gets too salty. Add your chilli now as well if you are using it.